Part Used & Method for Pharmaceutical Preparations: The seeds are removed from the ripe fruit and dried in the sun. Meridians: Spleen, stomach and large intestine. Functions: 1. To warm the spleen and stomach and promote circulation of qi; 2. To astringe the intestines and stop diarrhea. 1. Chronic diarrhea. 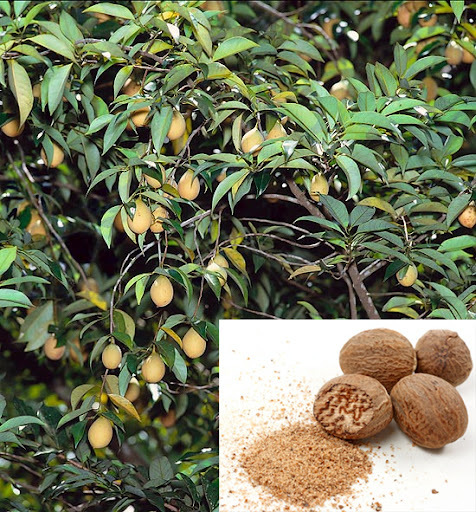 Nutmeg (Roudoukou) is used with Chebula fruit (Hezi), White atractylodes (Baizhu) and Pilose asiabell root (Dangshen). 2. Qi stagnation due to deficiency and cold in the spleen and stomach manifested as epigastric and abdominal pain, vomiting and nausea. Nutmeg (Roudoukou) is used with Costus root (Muxiang), Fresh ginger (Shengjiang) and Pinellia tuber (Banxia). Dosage: 3-10 g decocted in water for internal use, or 1.5–3 g, if used in powdered form. Cautions & Contraindications: This herb is contraindicated in cases with damp-heat diarrhea or dysentery.